Of Yet Another Baby: Just Publish it! I often find myself involved, without much choice, in Mark’s different projects. I guess, sometimes, people would probably wonder what exactly I’m doing to be always beside Mark. I guess it’s just in this year that I stopped being around. It’s hard to explain what I do. But most of the time, I’m the taker of the unfilled position. In rare times, a project would succeed then I would exit. Sometimes, they failed, then, again, I would exit. So now I’m yet in another new project. This time, I felt I’m really old. Gone is my naive-ness. I kinda have a blueprint of how things will start, will work, and will go through “throes of sorrow,” will go big. There’s no success, as there will always be bigger success. I guess we can define success as being able to pass “throes of sorrow,” of getting that traction. But then we all know, after that, more hardwork will come. Somehow I also have a pseudo blueprint of what type of people will make a project thrive. Passionate is one. Another one is shrewdness. The latter part is actually a bit of a surprise to me, and you might disagree with me. I guess the passion keeps the fire burning, while shrewdness helps in moving things forward, to a different level. So anyway, I’m actually getting far from what I originally thought to write about. For a project to succeed, just publish it. Which literally applies to our new project, runroo.com, an online multi-media mag or whatever you call it. Sometimes, we get entangled with best practices and right practices or whatever those rules and policies and other pressures that we get so hold-up and end up with nothing. I guess this is where shrewdness applies. We just have to have this unbelievably huge faith in ourselves that whatever stuff we shove to people will work. If not, then create and again hit the publish button. I was (am???) feeling low today — some nothing-new major downer which I was just hoping to just pass by on its own. But then I learned of someone young passing, and good old friend’s broken relationship. 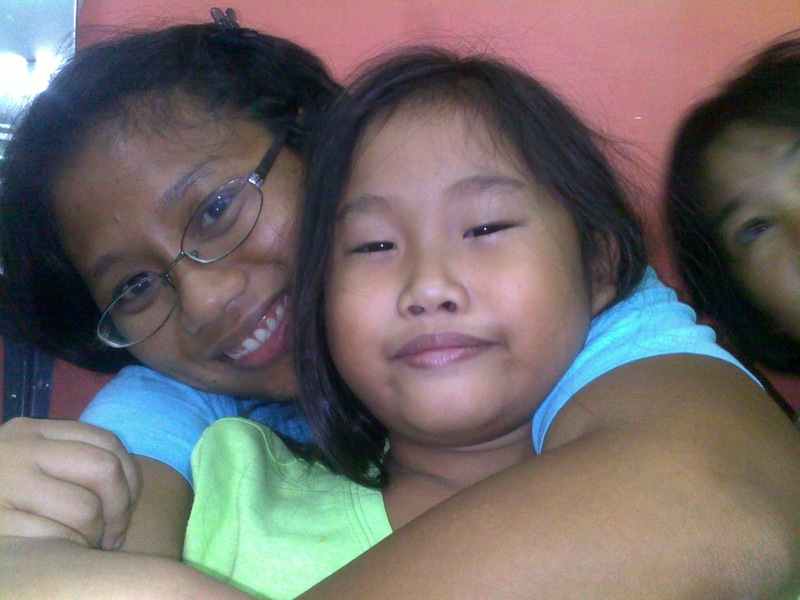 As much as I don’t want to take comfort from others’ miseries, but, yes, I have more reasons to be grateful about. We watched “Butter” movie last night. It’s a so-so movie if you’re expecting some kabooms. But I love it. We know that any one can create art or any thing, like a business. But it’s just rarity that someone can create something with a soul, the WHY; that factor that we cannot see but we can FEEL it that there’s more to what is tangible. The thing is this is not limited to art or other human creations. It’s happening to us, the humans. I guess we can conclude that superficial humans = superficial creatures. testing the ‘blogger’ app i just downloaded on mark’s ipad. i hope they’ll make an ipad version of this. lazy sunday – mark watching kawasaki talking about startup. nothing changes. So many things to write that I’d end up writing nothing. All the different thoughts wooshing and speeding in different directions in my head. My different thoughts are like kids, all screaming wanting my attention. Sometimes, I felt like crying of why can’t they tone down, and stay in one corner while I tackle one topic. But on another note, I felt more crying of why can’t I just let go all of them. Why can’t I just NOT write them down. Seriously, I’m the only one who cares about my pity thoughts. But probably it’s my equivalent to other girls’ obsession over shoes, bags, and such. I’m obsessed with my thoughts! But they’re my most prized collection like that scary looking useless antique jars of an aunt. I must must MUST HAVE them all. I could even write a book about my thoughts. It’s almost the end of the year, and, I have done nothing much of some to-do stuff I have mentally think of years ago. So I’m writing this one, as they say, broadcasting what you want to the universe will increase its probability of becoming realized. * Weed out clothes that are no longer used. 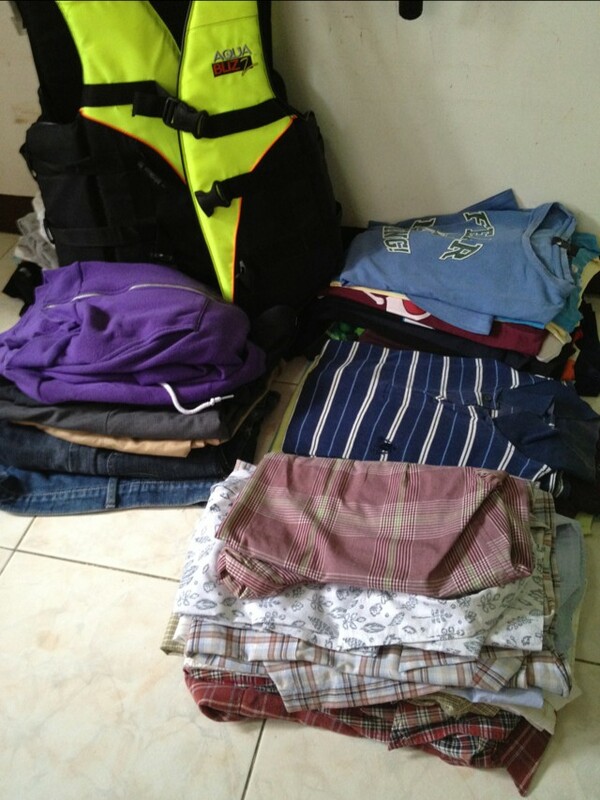 Mark had already done a lot of weeding out his stuff so I only have to do mine, and the kids. We do not have much stuff but we have very small space. This is my whole stuff. I don’t really have much. 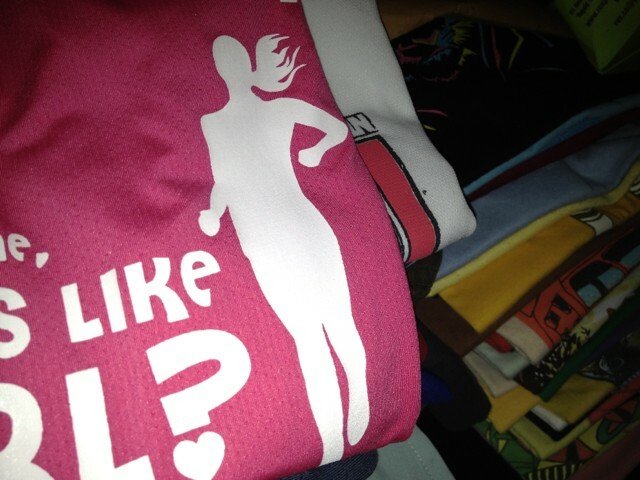 I have, either, threadless shirts or free singlets and finisher’s shirt from the races I joined. I certainly need new “smaller” sizes of clothes. The safest size for me now is medium, though I have a few small sizes. I think I lose weight. I really have no idea since I haven’t weigh myself. * Fix our screen doors. Seriously, I would be such a fail if these screen doors would not be fixed before the end of month. This is the topmost priority. 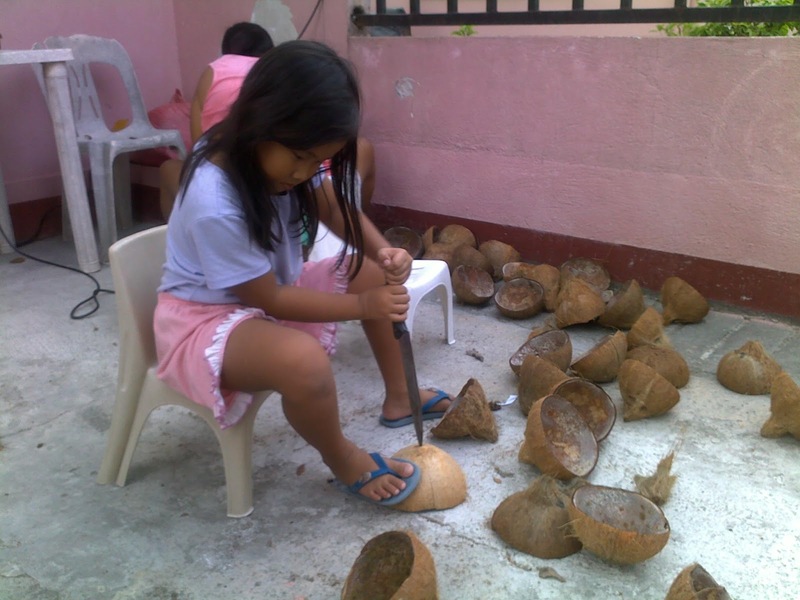 * Add more hanging bagol (empty coconut hust) pots therefore buy more bagol and driller “ammunition”. I had one side of our fence already completed with hanging bagol. I love how it feels. Though, planting lettuce and kale was not a good idea. I think I’ll use more traditional and warm-loving plants on the nexts. * PASSPORT. I don’t know how many times I attempted to process our passports in between the years that there there was NO piso fare yet, and now that probably the whole Philippine population except us has been to Disneyland HongKong already. * I’m generally not interested. * Mark does not want to line for NBI clearance in lieu of a baptismal certificate, as he’s baptized somewhere in Metro Manila. And, I don’t feel comfortable cheating for it. * Cabinets / organizers closet. Our house looks like one garage. Bicycles and kitchen stuff sprawling around. As I said, we don’t have much but we have a dollhouse. 13th Anniversary: Relationship for Convenience? I’d been asking him if I’m her moon, her star, her sun? And, he always said NO. I’d been asking him why cannot he say he’d cross the mountains, and swim seven seas for me just like in the songs and in the movies; why can’t he say I’m the center of his universe. He’d reply because he’d never do that to any one. When we’re still gf-bf, I’d be hurt a bit because why he could not say sweet stuff like in movies / books / songs even if he would just fake it. But came marriage and 3 kids in-a-row, there are more things to sweat about than me being more beautiful than the moon and the stars, and the Miss Universes combined in his eyes. But from time to time, I would ask him just for fun, to tease him, and still I got the same answers. Then, we’d agreed that since he does not see any thing special about me, we’re probably having some relationship for convenience. It means that the love universe did NOT connive that we got into a relationship. It’s just that at that moment, it’s the most convenient thing to do — he was single and I was single, and we happen to like the idea of having a relationship with no particular type of person. It’s not because there was some love at first sight, or that he saw the stars and moon in me. And, we’re still together until now because it’s convenient thing to do. As Mark would say that why would you make it complicated and difficult. Last week, I asked him again as a way to remind that September 10 is nearing, which is our anniversary as bf-gf. I got the same answer. AHA! Then I thought maybe that is what is TRUE LOVE. True love is when you just simply love someone for no reason at all; stick with someone though you don’t see any thing extraordinary or special about him / her. Happy 13th year of convenience, Mark John! Because love is passe. I have to do this in a hurry as I will not be back until Sunday, and I don’t want to leave without posting this. 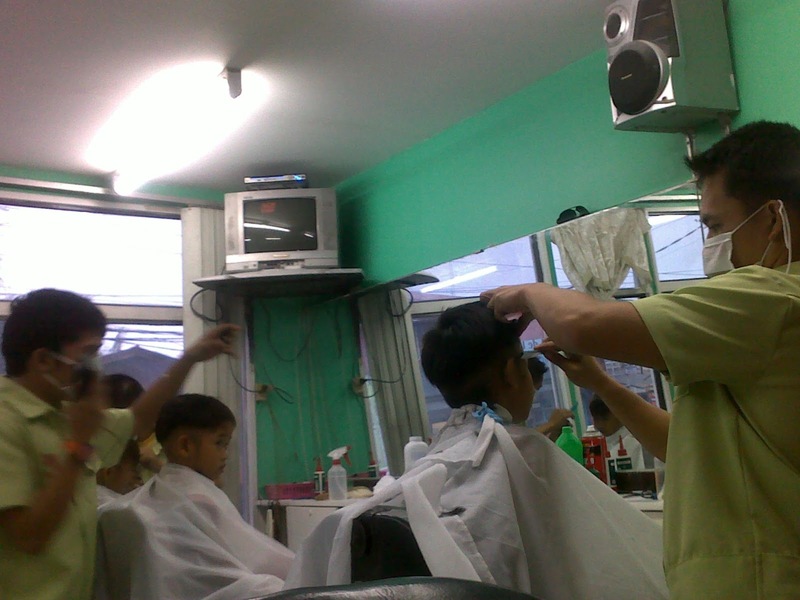 I brought the 2 boys to a barbershop before their Buwan (or is it Linggo) ng Wika culmination so they would have a clean cut for their presentations. This pic was taken while Meg and I were waiting for the boys to be done with their haircut. I realized how I’m so “dark” already. I don’t have problems with it though. 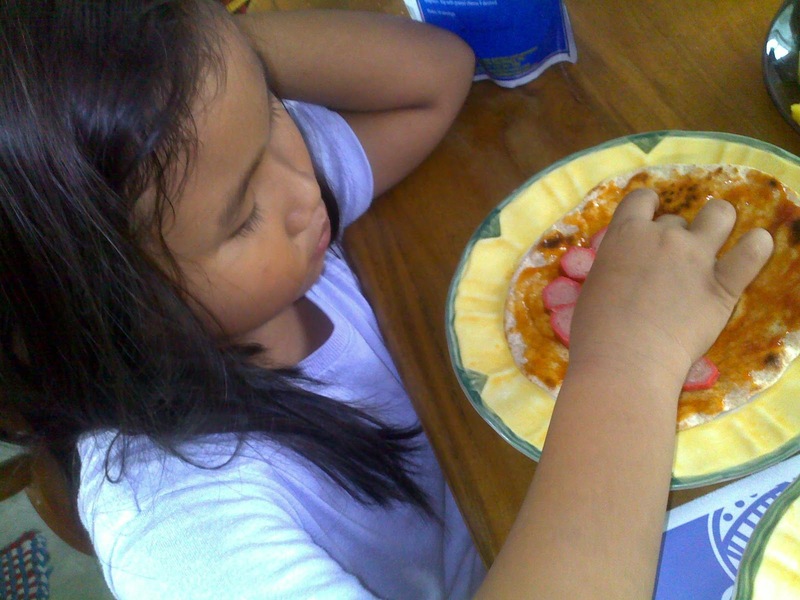 We made some DIY pizzas. 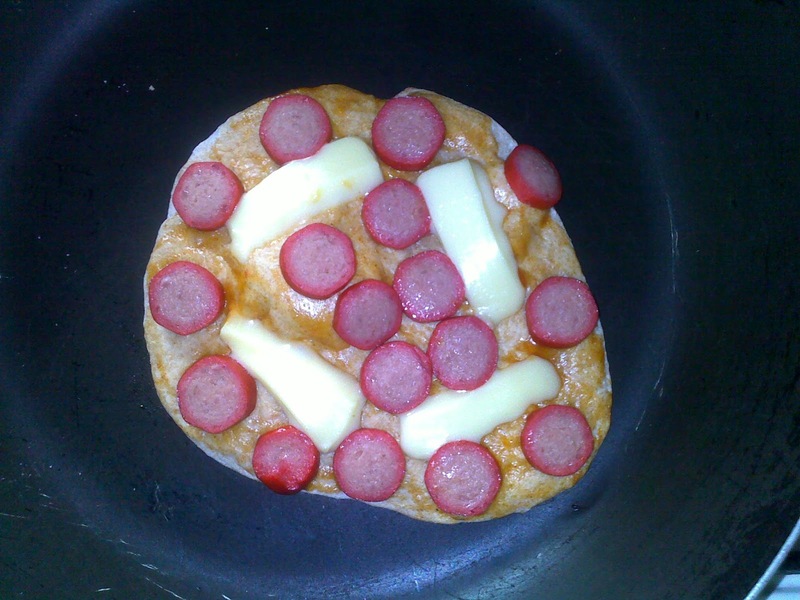 I used the pita bread as the dough the kids would deck with whatever toppings they can think of. 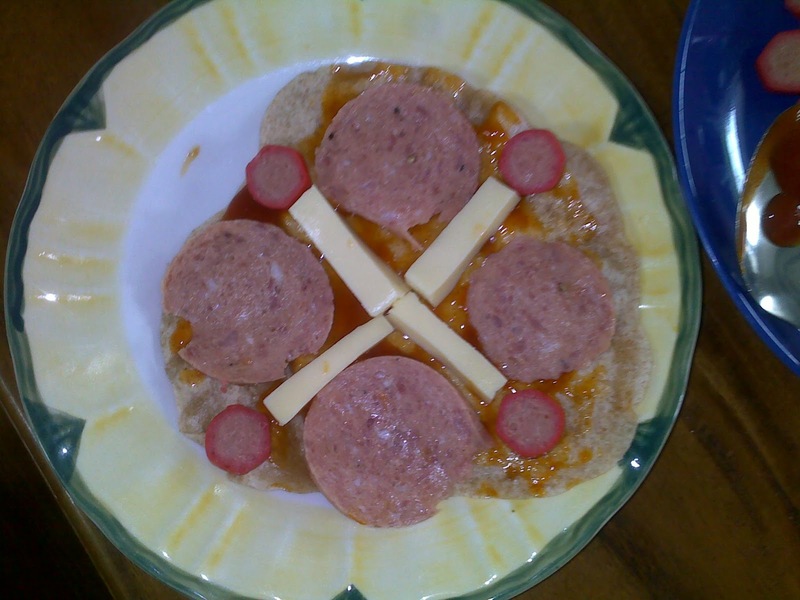 The winner for them is the hotdog/cheese/spag sauce. 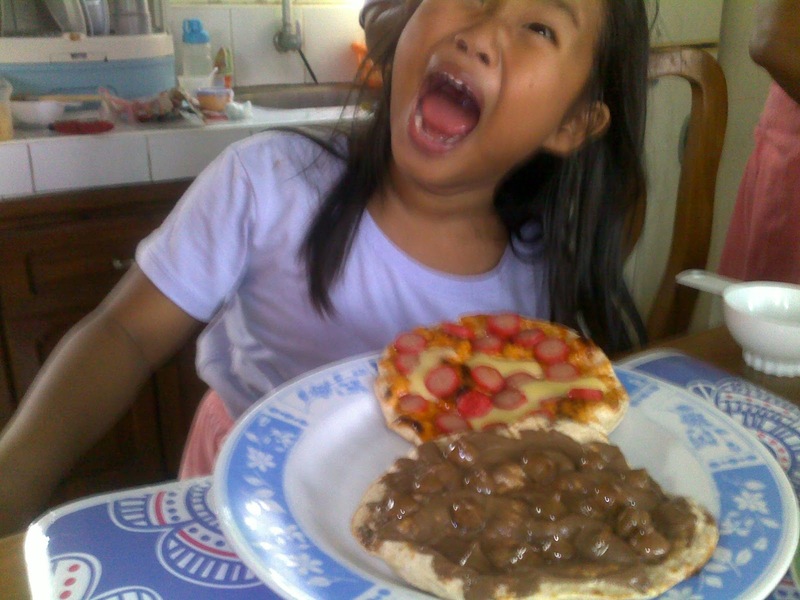 With Meg is chocolate spread and choco bits for cookies. 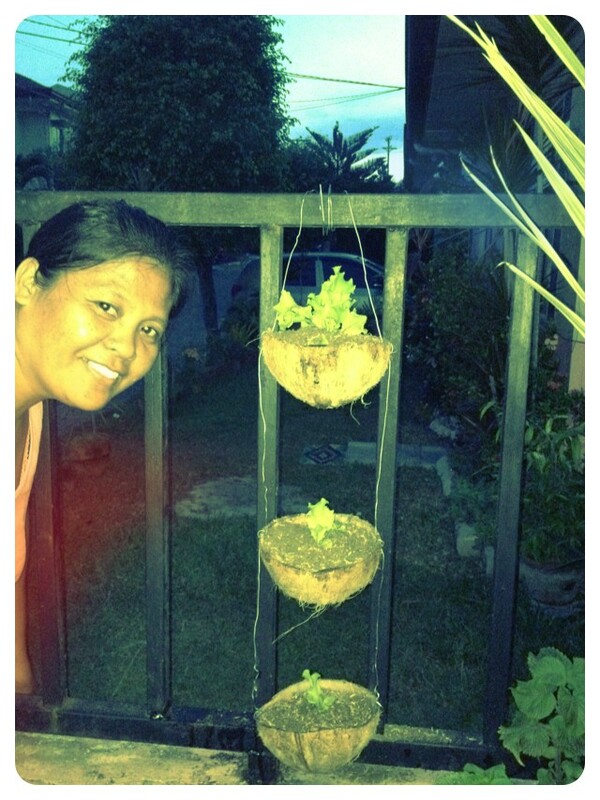 Finally, I got started making the “vertical garden” using coconut husk (bagol). Meg helped out in making holes on them. 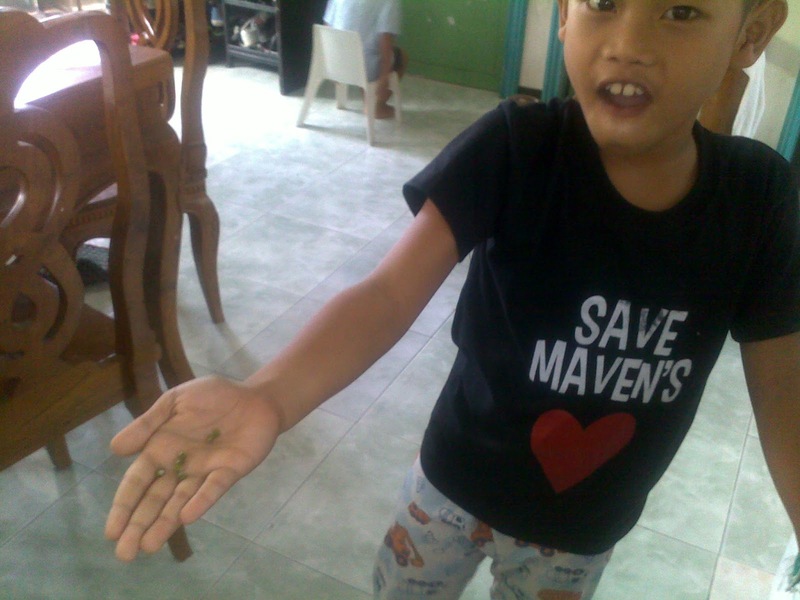 Migi harvested again 2 peas from his monggo plant. He’d been eagerly waiting for them to turn black and dry. 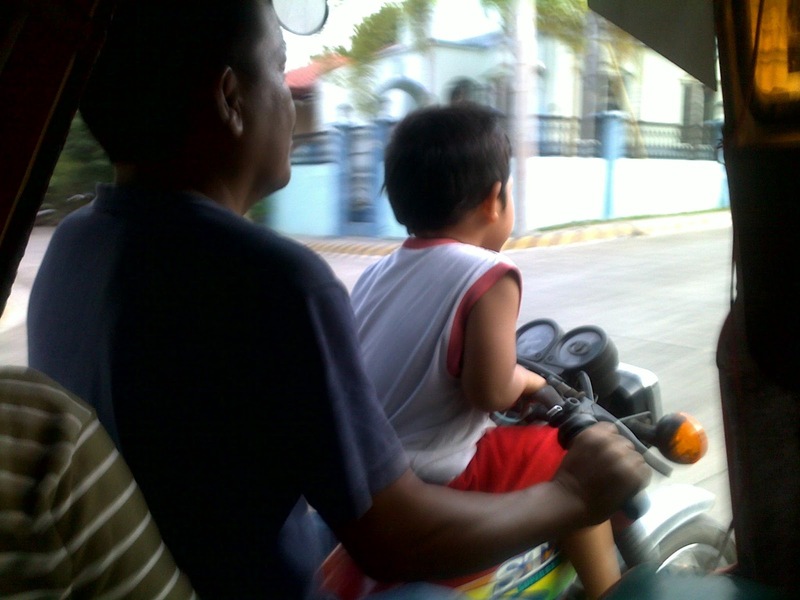 I’d been starting to review Mati for his 1st periodical exams this week. 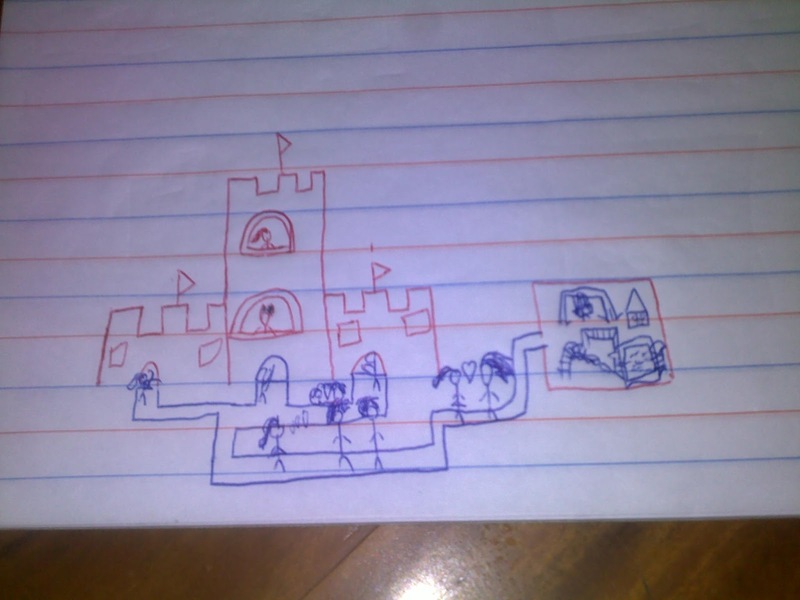 And, Migi was doodling again on Mati’s paper. If our whole house looks like a mural (but more of vandalized gheto alley), it’s because of Meg. As I said, birthdays in our family are quite templated. It’s spag/chicken/cakes/ice cream then add in some neighborhood friends and / or relatives kind of celebration. And as special request by Meg — it should be white rice. 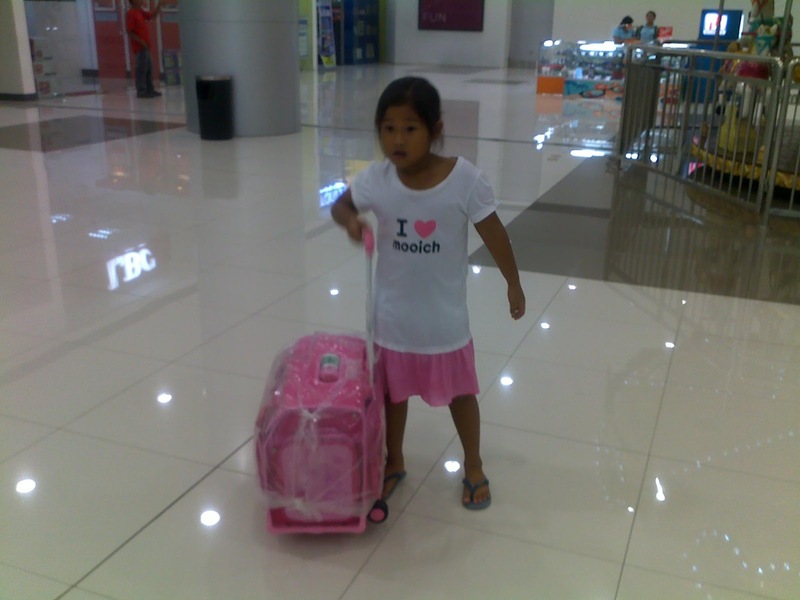 Before her birthday, we went to SM Consolacion to get her birthday gift, a new school bag, which is the same with Migi except it’s PINK! Then, Saturday, we got her cake. 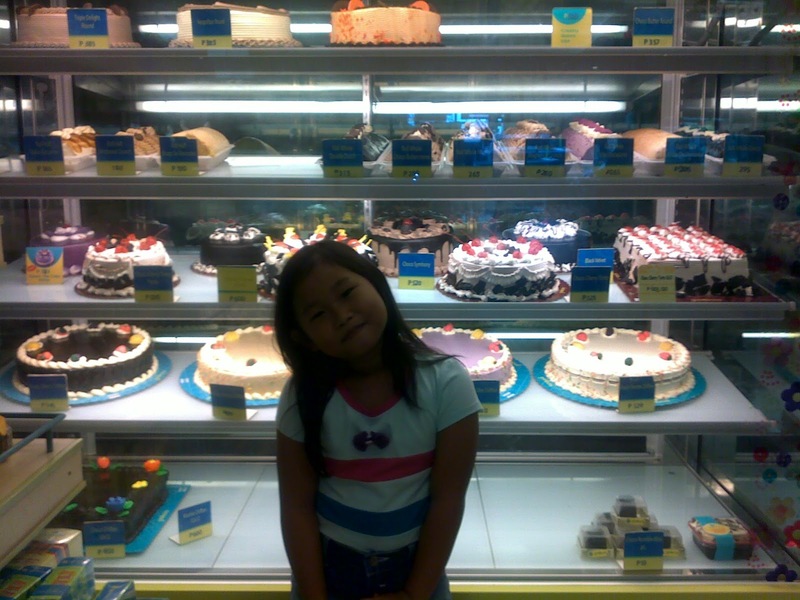 She wanted a “cookies and cream” cake, but, unfortunately, it was NOT available on that day. She went for a chocolate cake instead. I was a bit surprised that she no longer ask for a “cartoon character-themed” cake. It was raining hard on that day so the neighborhood kids were not much of an attendance. 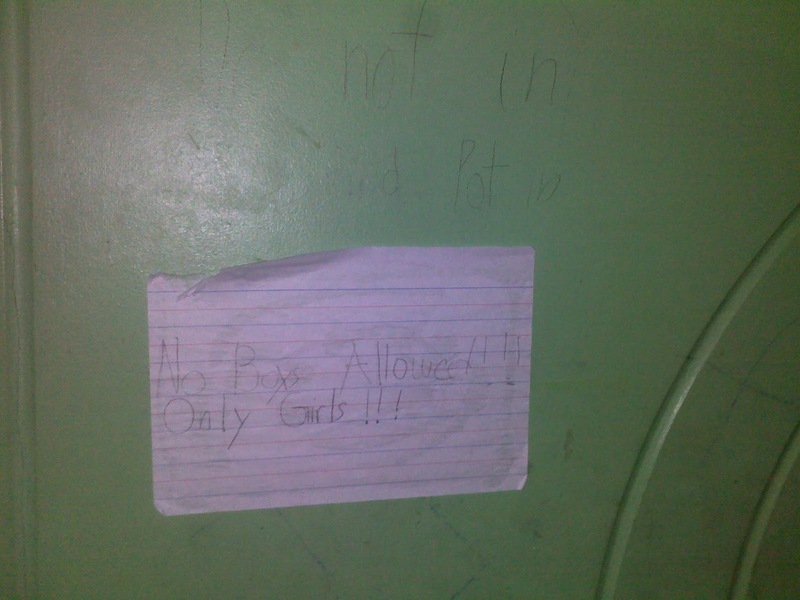 The note posted on the door definitely showed who’s having the party! Mark has been sick since yesterday, or actually the past days. But he was staying at home since yesterday, and he has done nothing but does the same thing he always do — glued to his laptop or mobile device.